JBL Pulse 2 speaker is perhaps the most stylish and good-looking speaker by JBL. The sound performance of the speaker is simply amazing. It actually hits all the right notes. The bass base of the speaker is good and it does not suffer in treble too. JBL Pulse 2 speaker is indeed a fantastic portable Bluetooth speaker with some great features. The speaker will surely enhance your music experience with the essential studio and interactive light display. As the speaker features multi-colored display lights, you can enjoy your music with a rhythmic glow. The speaker uses a color sense technique like no other speaker in its range. You will surely love the music with the display of wonderful lights. It’s an ideal choice for your house parties. There is no significant change in the design of the JBL Pulse 2 speaker. The shape is cylindrical but it’s taller as compared to other speakers of JBL. The speaker is splash proof so you can enjoy your music in the rain and while traveling too. The speaker can light up with amazing high-quality stereo sound to give you a great music experience. The battery performance of the speaker is good and that is exceptional. It gives you 10 hours of music playback with a single recharge. With customized options and light display, this is indeed a great speaker from JBL. If you like to flaunt your speaker in style, then this one is for you. It will help to elevate your music experience to a new level. The interactive light feature along with sound will truly transport you to your own world of music. The multi-colored visuals of the speaker are a treat to the eyes. You can use this good sounding speaker at your party or playing your music loud. The prism colored sensors gives it an edge over other speakers available in this range. The style is so amazing and that is the highlight of this good sounding speaker. If you like a hands free experience, then JBL Pulse 2 speaker makes a great choice. The speaker has an in-built speakerphone that helps you to receive and take your calls with a single button. You can also use the echo-canceling feature of the speaker to enhance the voice clarity of the speaker. Is it for outdoors? Well, yes it is indeed for your outdoor needs and traveling. The speaker is splash proof so you can enjoy pool parties with your friends. Its also stain resistant so you don’t have to worry about the spills. It is durable so even if you drop the speaker, it will not really affect the studio quality. It’s indeed a perfect companion for your traveling and pool party. There are many great features of the JBL Pulse 2 speaker, let us look at some of them. JBL Pulse 2 speaker elevates your music experience to a supreme level. It features essential sound with the amazing interactive light show. The multi glowing colored visuals of the speaker will surely enhance your music experience. You can play it loud at a house party or pool. The speaker features full control prism color sensors. You need to point and shoot the lens of the color to amplify your music experience. The color and the light feature will surely blow your mind. JBL Pulse 2 speaker has 6000 mAh rechargeable battery that gives a great performance. On a full charge, it gives you up to 10 hours of battery backup. You can play your music loud and nonstop with the battery performance. The speaker has an in-built speakerphone that lets you make or receive all the calls at the touch of the button. It also features echo cancellation that lets you enhance the audio quality of the calls. The speaker is completely splash proof so it’s good to enjoy playing along in the rains. It is also stain proof so you can use it roughly. However, it is not waterproof so it cannot be submerged in water. JBL Pulse 2 speaker has a great connectivity too. Through JBL connect you can actually build your own ecosystem. 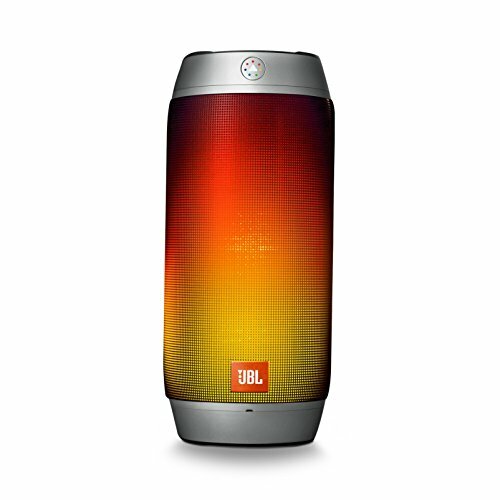 It lets you connect to different JBL devices to amplify the sound to the max level. It gives you an amazing music experience through JBL connectivity. The speaker features voice integration support. You can easily access Siri or Google now with this integration. With a single touch of a button, it lets you integrate and gives you easy access. The wireless Bluetooth streaming of the speaker is simply amazing. You can stream music from online apps and connect up to three smartphones at a time. The speaker though looks bulky in weight is not so heavy so you can easily carry the speaker along with you while traveling. You can charge the speaker through different micro USB sources. The charging is quick so it saves a lot of time. Though it resembles the previous speaker of the JBL Pulse, the highlight of the speaker is its LED system that is built beneath the box grill. The design is indeed stylish and build quality of the speaker is sturdy. The light sensor on the power button makes the speaker looks good. The rest of the controls are on the speaker and you can easily access through the touch of a button. JBL Charge 3 speaker is larger than the JBL Charge 2+ and comes with more bass. Even the controls are easy to access as the interface is simple. The build is great and that makes this speaker durable if you compare it with other speakers that are available in this price range. JBL Pulse 2 speaker maintains the excellent balance of sound and this is where it scores the highest. The sound performance is damn good for the price. It may not be exceptional and superlative but its amazing for sure. The midrange with bass and treble is good. It does not really suffer in the high-frequency range as well. However, there is no distortion even when the volume is on the higher side. You can enjoy your music loud and clear with this speaker for sure. The vocal performance and overall dynamics of the speaker are also good. The LED light makes even more difference in the sound performance to enhance your music experience. The setup and interface of the speaker are simple and the design is good. It features power control buttons and Bluetooth connectivity buttons on the top. The speaker features an in-built speakerphone that lets you receive and make calls with exceptional clarity. It also features an echo-canceling button that helps to enhance your voice clarity while speaking. The controls let you easily integrate with other devices so you do not have to wait for integration. You can also set a customized light show to enhance your music experience. You can set the speaker according to ambient light or the occasion. JBL Pulse 2 speaker delivers an excellent sense of bass. Even if you play the speaker at a loud volume, there won’t be any kind of disturbance or distortion in the sound of the speaker. Being portable also, the audio sounds great for giving you an amazing music experience. In the mid-range, the sound is clear and crisp and this is where it scores the most. The speaker is compatible with almost all the wireless and Bluetooth devices. You can connect the speakers to other JBL speakers to amplify your music experience. It also integrates with other speakers to give you an amazing sound performance. JBL has really taken over strongly with JBL Charge 2+, then JBL Flip 4 and then with the JBL Pulse 2. The connectivity of this speaker is simply amazing. It lets you connect to all the Bluetooth and wireless devices to play your music loud and clear. A wireless Bluetooth streaming connection lets you stream your music on the go. There is no issue is connectivity so you can enjoy your music on the go. The battery performance of the JBL Pulse 2 speaker is great but not outstanding. Though the charging is quick, it gives you about 10 hours of playback, which is good for a speaker with wireless and echo-canceling. You can also charge the speaker with other USB sources. Has multicolored LED light display. It has a built-in speakerphone. If you liked JBL pulse then pulse 2 will surely up your music experience a notch higher. It’s not only updated in features but this is a tad more stylish as compared to other speakers in this range. The sound performance of the speaker is amazing as it looks. The only drawback of the speaker is that it is not waterproof. But its splash proof and you can also use it outdoors. It integrates well with other devices to give you an amazing music experience. The speaker has great features and it is totally worth your money. You won’t be disappointed with the speaker as it is indeed a top choice for a portable Bluetooth speaker.